Yesterday when Doug Zeeff was savagely blown out by Infernities, we gave him a shot at redemption. Today we’re going to do to the same thing for German Duelist Benedikt Junk! Junk is riding the bubble with an 8-2 record with Dark Worlds, while his opponent Justin Ward has the same record with Fire Fists. Whoever wins here has a very good shot at the Top 32 if not a guaranteed spot in the top cut. The loser will likely be out of the tournament. 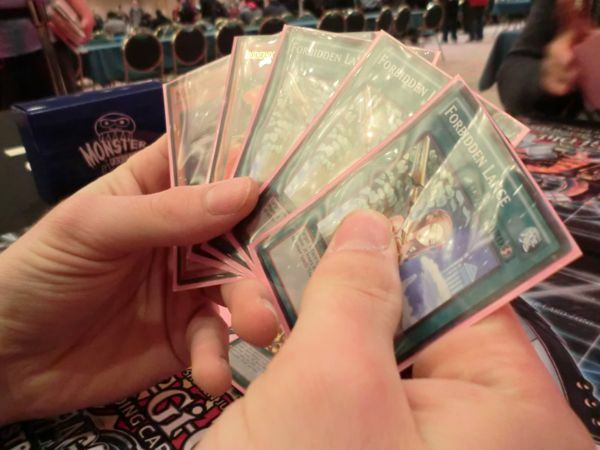 Justin Ward’s been on the bubble once before, and while Junk has topped several European YCS tournaments, he’s bubbled out here in the US five times. This would be a milestone victory for whoever won this Match. Junk opened the Match with Upstart Goblin, drawing a card and then activating Dark World Dealings: he discarded Snoww, Unlight of Dark World while Ward pitched Pot of Duality. Snoww searched The Gates of Dark World from Junk’s Deck, and he followed up with Allure of Darkness, drawing two cards and banishing Tragoedia to complete Allure’s effect. He activated Gates, banishing Snoww to pitch Broww, Huntsman of Dark World from his hand, then drew two cards (one for Gates and one for Broww). Next he tossed Grapha, Dragon Lord of Dark World for Trade-In: he drew two cards and set one to finish his turn. Ward was holding Mirror Force; Fire Formation – Gyokkou; two Fire Formation – Tenki; Forbidden Lance; and Cardcar D. He activated Gyokkou to pin down Junk’s one Set card, then searched Brotherhood of the Fire Fist - Bear with Tenki. He Summoned it, attacked for 1800 Battle Damage, and Set another Tenki. He Set two cards to his backrow to finish out. Junk banished Broww for Gates, discarding Grapha to draw a card and destroy Ward’s Set Mirror Force. He Set a second card, then a third to his backrow. Ward drew Pot of Duality and flipped his Set Tenki, searching Brotherhood of the Fire Fist – Gorilla. He Summoned it, then made a direct attack for 1900 Battle Damage with Gorilla, then another 1900 with Bear, not using its effect. In Main Phase 2 he popped Gates with Gorilla’s ability, sending a Tenki to the Graveyard, and overlaid his Fire Fists for Brotherhood of the Fire Fist – Cardinal. 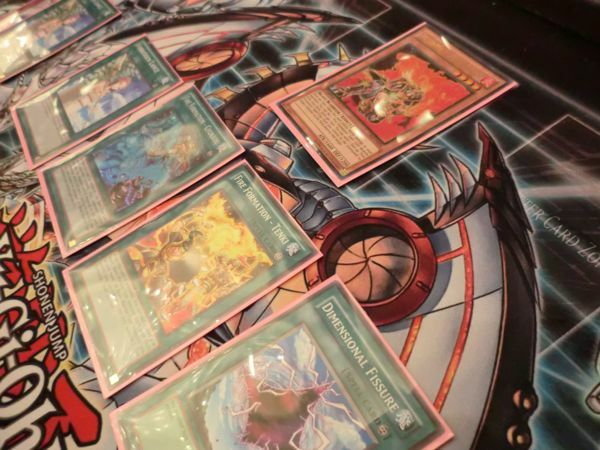 He returned both of his Tenkis to his own Deck, and sent Junk’s Grapha back to his. He Set another Spell or Trap. Junk discarded another Grapha for another Trade-In! He Normal Summoned Tour Guide from the Underworld, Special Summoned Broww, Huntsman of Dark World, and Xyz Summoned Leviair the Sea Dragon. He detached Broww to activate its effect, Special Summoning Snoww, and activated another Gates. He banished Broww to discard another Grapha, drawing a card and destroying Ward’s Set Pot of Duality. He Tributed Snoww for Deck Devastation Virus, revealing Ward’s hand, and Special Summoned Dark Armed Dragon! He banished Snoww to target Ward’s Set Forbidden Lance, which Ward chained to reduce Dark Armed Dragon’s ATK, and then followed up with another Gates. He banished a Grapha to pitch Snoww and draw, then searched Grapha with Snoww’s ability. He banished Snoww to destroy Fire Formation – Gyokkou , then banished again to pop Brotherhood of the Fire Fist – Cardinal. Leviair and Dark Armed Dragon both made direct attacks. Ward drew and revealed Mystical Space Typhoon; his only other card was his last Tenki, which was still in his hand. He blew away Junk’s Mystical Space Typhoon with his own, then played Tenkin to get Coach Soldier Wolfbark. He Summoned it and revived his Gorilla, but Junk picked up a card with Maxx “C”. He got another one when Ward Xyz Summoned Evilswarm Exciton Knight, destroying Leviair and Dark Armed Dragon. 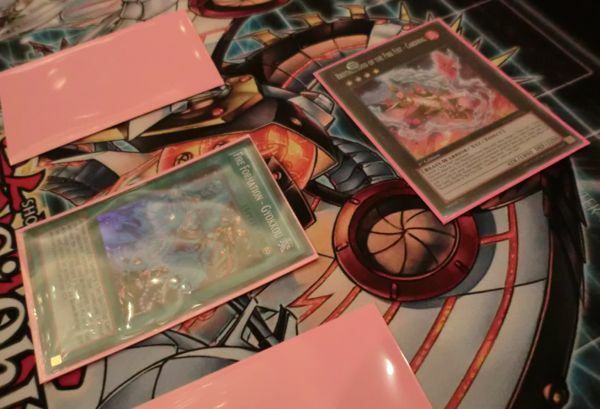 Junk drew to five cards, and activated Dark World Dealings pitching Grapha to destroy Evilswarm Exciton Knight. He Summoned Tour Guide, Special Summoned another from his hand, and made another Leviair to Special Summon back a Snoww. He bounced it to Special Summon Grapha, activated Upstart Goblin, then attacked for 1800 Battle Damage and 2700 more to drop Ward to 1700 Life Points. Ward drew Solemn Warning next turn and Game 1 was over! Ward makes what appears to be all the right decisions, and his topdecks treat him pretty well, but it’s just not enough to slow down the freight train that was Junk’s momentum from Turn 1. Benedikt Junk is now just one win away from a shot at the Top 32! Ward kicked off Game 2 with Fire Formation – Tenki; Forbidden Lance; Solemn Warning; Cardcar D; Dimensional Fissure; and Maxx “C”. He activated Tenki to search Brotherhood of the Fire Fist - Bear, then played Dimensional Fissure and Set a card to his backrow, before playing Cardcar D to draw two more Forbidden Lance! 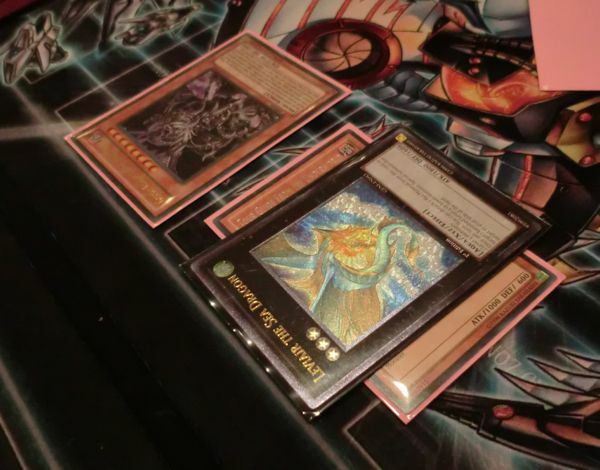 Trade-In got Junk two more cards, banishing his Grapha, Dragon Lord of Dark World. He tried to Summon Tour Guide from the Underworld, but Ward banished it with Solemn Warning. He Set two cards to his back row. Ward drew Fiendish Chain, Summoned Bear, and attacked into Mirror Force: one of those three Forbidden Lances saved the Bear, getting Ward a free Fire Formation – Gyokkou from his Deck. He flipped it in Main Phase 2 and Set two more cards. Junk drew to four in hand and Set another Spell or Trap Card. Ward drew another Tenki and attacked. Junk flipped overworked, but when Ward Cahined his second Forbidden Lance Junk was scooping in an instant! Justin Ward nails that first-turn Dimensional Fissure with a Solemn Warning, and with not one, not two, but three copies of Forbidden Lance he’s just unstoppable! Benedikt Junk was eager to get to Game 3. Junk started the final Duel of the Match with a handshake and Tour Guide from the Underworld, Special Summoning another Tour Guide from his Deck. 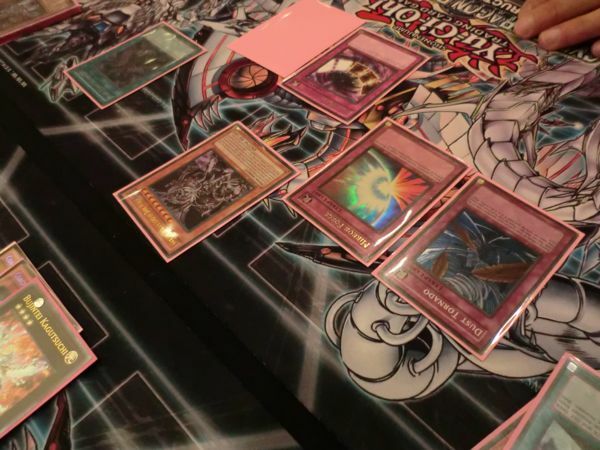 He Xyz Summoned Number 17: Leviathan Dragon, detached, and then activated The Gates of Dark World to banish his Tour Guide, pitch a Broww, and draw two cards. He drew two more discarding Grapha for Trade-In, then Set one card to his back row. Ward had Mystical Space Typhoon; Coach Soldier Wolfbark; Dimensional Prison; Fiendish Chain; Bottomless Trap Hole; and Fire Formation – Gyokkou. He activated the Fire Formation to lock down Junk’s one Set card, then Set everything but Wolfbark. Junk banished Broww for Gates, but Ward Chained Mystical Space Typhoon to destroy the Field Spell and keep Junk from getting his draw. Junk swung Number 17: Leviathan Dragon into Dimensional Prison, then Normal Summoned another Tour Guide to Special Summon a Broww, Xyz Summoning Leviair the Sea Dragon… right into Bottomless Trap Hole. “Why didn’t you wait for the Grapha?” Junk Set a second Spell or Trap. Ward drew another Coach Soldier Wolfbark. He Summoned the first one with no target for its effect and attacked for 1700 Battle Damage. Junk Set a third Spell or Trap. Ward drew Banisher of the Radiance and made another direct attack with Coach Soldier Wolfbark. He Summoned Banisher in Main Phase 2, and Junk paused for just a second before moving on with his turn. He Summoned Snoww and attacked into Fiendish Chain, Setting a fourth backrow. Ward drew Debunk and Summoned his second Wolfbark! He overlaid them both for Bujintei Kagutsuchi, banishing Dark Hole, Mirror Force, Forbidden Lance, Brotherhood of the Fire Fist – Gorilla, and Brotherhood of the Fire Fist - Bear. Kagutsuchi attacked over Snoww to drop Junk to 3700 Life Points. He set one and passed, losing his Debunk to Dust Tornado in the End Phase. “Yeah, I wasn’t sure why you didn’t do it,” remarked Ward. He drew Fire Formation – Tenki, activating it, but after much thought Junk Chained Full House! He targeted Ward’s two Fire Formations, but had to hit a whopping THREE of his own face-downs! He lost his Dark World Dealings, his Mirror Force, and his Gyokkou-locked Dust Tornado, just to stop Ward’s Fire Formation – Tenki from resolving! It was a huge gambit, costing him four cards to stop just one. But it worked, at least for the moment: Ward had nothing and ended his turn. Junk attacked Kagutsuchi to knock a Material off it, then Set a Spell or Trpa. Ward drew and Set Banisher of the Radiance. Junk attacked it with Grapha, and Set a third backrow. Ward drew Dimensional Prison! He Set it! Junk attacked into it and lost his Grapha! That could be the opportunity Ward needed! Junk pitched The Dark Creator for Trade-In in Main Phase 2: he drew two cards; he’d had only four Darks in his Graveyard! He Set a Spell or Trap. Ward drew Torrential Tribute and attacked into Mirror Force, losing his last Material from Kagutsuchi. Junk blasted the Mirror Force in the End Phase, destroying it with Mystical Space Typhoon. Junk drew to two in hand next turn with two cards Set and Gates active, to Ward’s lone card: the Kagutsuchi. 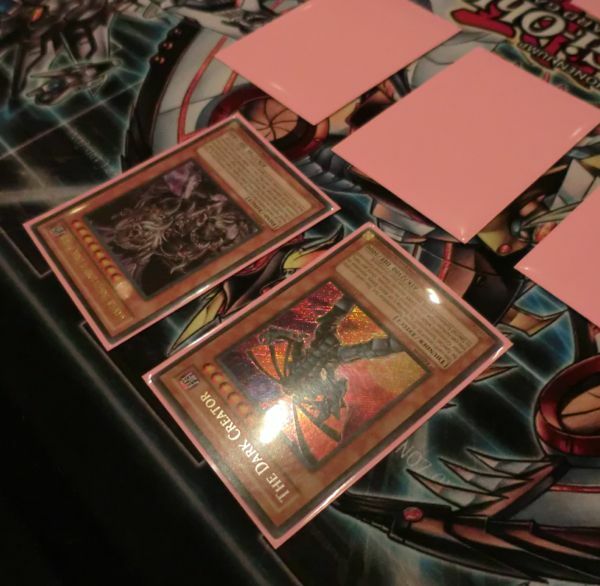 Junk pitched Snoww for Gates, drawing a card and searching Grapha, Dragon Lord of Dark World. He dumped it with Dark World Dealings to destroy Kagutsuchi, then Set a third Spell or Trap. Ward topdecked and played Dimensional Fissure! Junk ripped The Dark Creator and gave a sharp gasp! “Yes!” He Special Summoned it, used its ability to revive Snoww, then bounced it to Special Summon Grapha! “I don’t know if I should over-extend or not,” he mused. “I’ll just attack.” Suddenly Ward was down to 3200 Life Points. He topdecked Forbidden Lance next turn, Junk ripped the Mystical Space Typhoon next turn, and it was all over! Junk slumped in his seat a moment, clearly exhausted, and offered Ward a courteous handshake. Benedikt Junk fights back from his misplay by activating a Full House where all the face-down targets were his own cards, buying the time he needed to clinch the Duel with The Dark Creator! An inventive showing from Junk allows him to finish the Swiss Rounds 9-2, his chances for the Top 32 looking pretty good! Round 11 Feature Match: Gabriel Andrade Versus Rob Chung Round 11: Top Table Update!